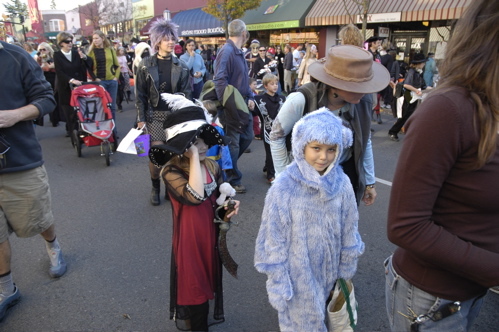 A blue polar bear and a pirate girl went wandering down the streets of Ashland, OR today. Fortunately no one noticed because they were part of a large parade of oddly-dressed people. 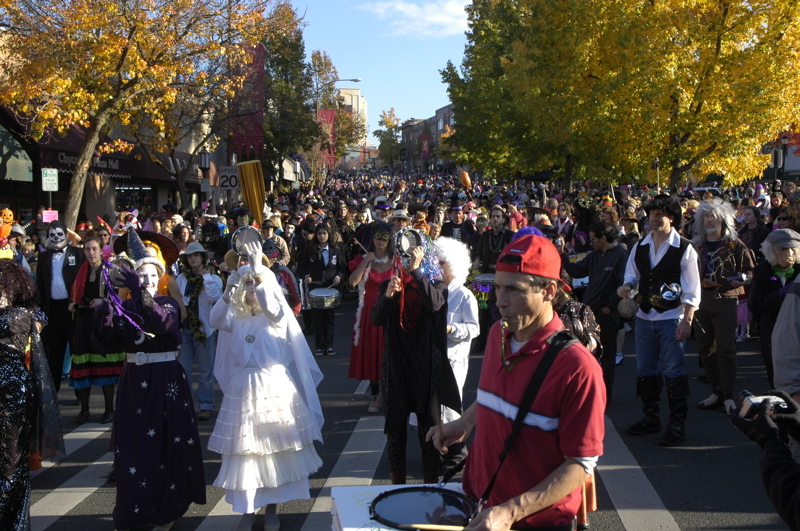 Ashland throws a huge costume parade down the main street for Halloween, and we were invited to attend by our new friends Kelli, Rob, and Allison. I say “new friends” because we’ve never met them before. Like us, they are traveling in an Airstream trailer with a young daughter and blogging the experience. Kelli and I have been reading each others blog for a few months, and Kelli realized recently that we would all be in Oregon right around Halloween, and invited us down so the girls could trick-or-treat together. That turned out be a superb idea. Not only did Emma and Allison have a fabulous time together (parading, collecting candy, sharing their own private booth for pasta dinner after the parade, etc.) but the adults found a lot of common ground too. We’re thinking about getting together for some travels in California in the next couple of weeks. The Ashland parade was full of incredible and creative costumes, but the most amazing costume we saw today had to be Zoltar. This guy not only built the booth (full of intricate details) and the costume, but mounted the whole rig atop a Segway so it could travel along the sidewalks and streets. Without video it’s hard to convey how startling it is to see an entire booth, complete with mystical fortune-telling “robot” inside, roll up to you. It’s even more magical when strange music begins to play, and you hear Zoltar’s recorded voice announce in ethereal tones, “ZOLTAR SPEAKS!” Then he either tells your fortune or a joke, and the “robot” inside slowly picks up a candy and drops it in the bin so that you — the lucky recipient of a visit by Zoltar — can retrieve it. 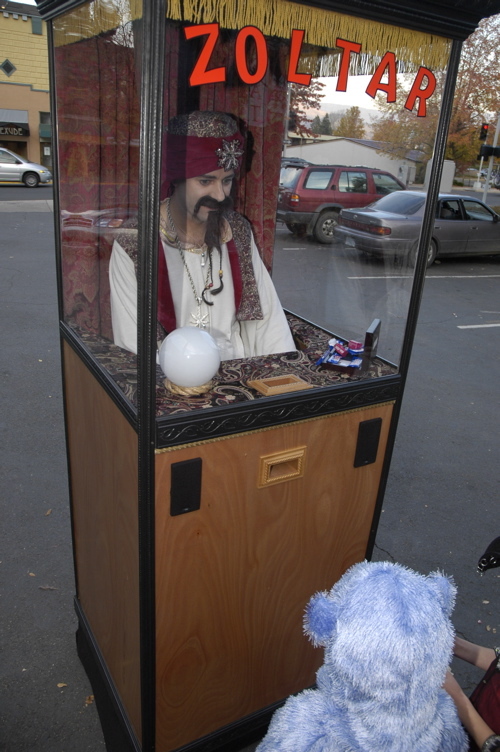 And then, Zoltar silently glides away, booth and all. It’s pure magic, and the guy who came up with it deserves some sort of award. Nicely done. 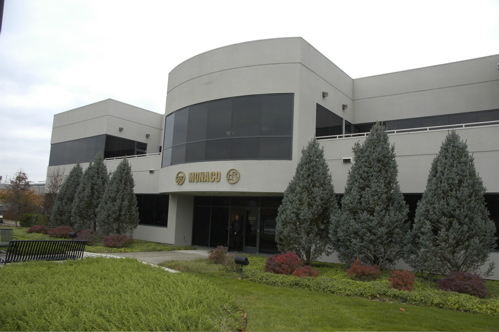 It turns out that just up the road from Eugene are the assembly facilities for both Monaco Coach (expensive motorhomes) and Marathon Coach (extremely expensive motorhomes). They’re right across the street from each other in Coburg, OR. I like factory tours in general, and of course have a professional interest in travel vehicles, so the opportunity to see how these RV’s are built was impossible to pass up. (It doesn’t hurt that the tours are free.) Monaco runs the tours at 10 a.m. and 2 p.m. currently, and Marathon runs theirs at 11:30. The Monaco tour can run 1-2 hours (ours went almost a full two hours) so if you want to do both, go see Marathon first. As is typical for these tours, cameras are not allowed, so I have no photos from inside the plant. But I can tell you it’s a great tour with lots of opportunities to get very close to all phases of the process. We watched as the motorhomes were welded together literally from the ground up starting with 3×8 box sections of steel for the frame rails. Monaco builds the whole coach including the chassis, whereas most manufacturers buy their chassis already pre-built, so you get to see just about everything that goes into making a motorhome. 1) Like most Class A motorhome manufacturers, they don’t make a two-bedroom floorplan. 2) I don’t have $500-800k to blow. We’ve moved on to our next stop, Valley of the Rogue State Park, between Grants Pass and Medford OR. We’ll spend Halloween here and take a couple of days to get other things done before heading into California. UPS dropped off the replacement unit around 10:30 and Joe had it wired in place within 30 minutes. The job was about 1.75 hours of labor in total, including a few minutes to swap our spare tire for the new one we bought this week. By noon we were on the road. It’s great when the plan comes together. I have to acknowledge the behind-the-scenes contribution of David Tidmore at Roger Williams Airstream in Texas. David’s shop installed these brakes originally, and he made himself available to consult with me several times during this episode, offering advice and facilitating the replacement unit from Actibrake. That’s really great customer service. There is one small problem remaining to be fixed. During the swap of the actuators, a tiny bit of air may have gotten into the brake lines. Skipanon doesn’t normally work on hydraulic brake systems, so they didn’t know how to bleed the lines. During testing of the system, I could tell that the brakes are not quite as aggressive as they were before, and I suspect air in the lines is the cause. The brakes are still very good and the trailer stops well, but it could be just a tiny bit better. So we put some miles behind us and headed straight down to Eugene OR, where we can visit our friends at George M Sutton RV (an Airstream dealer). I may have them bleed the brakes tomorrow, but mostly it’s a good excuse to drop in on George and Martha Sutton and say hello. George and Martha have been major supporters of Airstream Life magazine for over two years, and we’ve parked overnight in their lot every time we’ve been in Oregon. This is the third time we’ve visited with them. By coming down to Eugene via I-5, we’ve made a conscious decision to skip the rest of coastal Route 101. Our next major destinations are in California, and the season is getting near the end for certain places at higher elevation. After a lot of discussion over the atlas, we made the tough call: we’ll skip the rest of the coast (most of which we’ve driven before) and speed up our travels through Oregon so we can get to California sooner. I’ve discovered that just a few miles from here are the Monaco and Marathon Coach factories, and both offer factory tours. Tomorrow we’re going to drop in on at least one of them, while the Airstream is being serviced. I remember spending Sundays at home when we lived in a house. I always felt challenged to find something different to do on Sunday in the winter, because otherwise there would be a tedious sameness to the day and by nightfall I would be feeling as though I had spent a day pacing a jail cell. One of the things I like about moving around more or less constantly is that when Sunday rolls around there’s usually something new to explore. I’m not one for watching football, or walking the same walk with the dog. Even in a little town like Astoria there’s a bouquet of novel things to see and do, so Emma and I headed out today while Eleanor stayed back to finalize Emma’s Halloween costume. Astoria is sort of a tiny version of San Francisco, a town with a harbor, a long bridge, a steep hill, and lots of interesting Victorian houses. 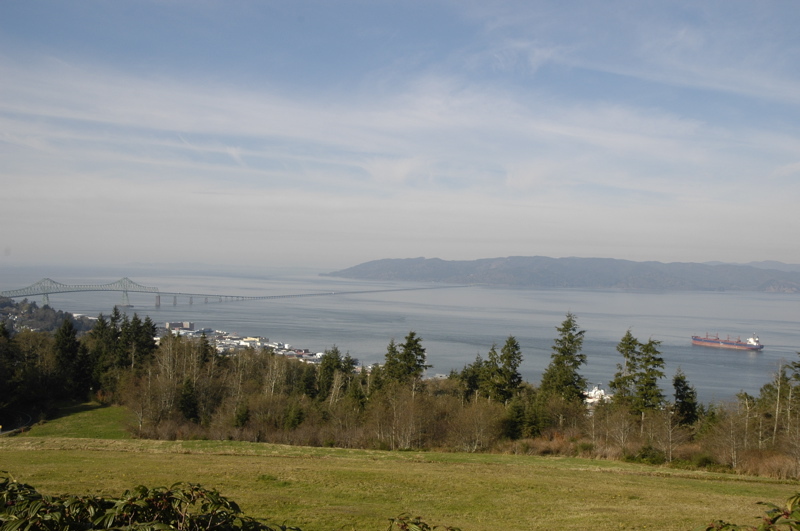 Atop the big hill is Astoria’s version of Coit Tower, called the Astoria Tower. Take a couple hundred spiral steps up to the top and you get a superb 360 degree view of town, the Columbia River, the Pacific Ocean, and the inland forests. Down by the river there’s a long multi-use trail that follows the river and reveals the remnants of a dozen canneries, several ocean-going ships anchored (waiting for a chance to go up the ship channel to Portland), a Maritime Museum, several piers covered mostly with restaurants, and a cute rickety old wooden trolley running east and west. We walked most of the trail, down to Pier 39, and then picked up the trolley for the ride back. 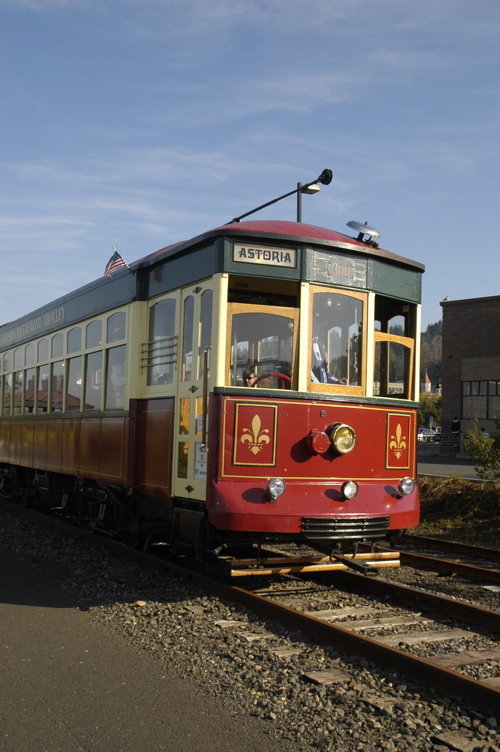 You can ride as much as you want for just a buck — a bargain — and the volunteers who run it tell stories about the history of the waterfront as it rumbles and creaks along the rusty rails. From downtown we headed over to Fort Stevens, a state park just up the road from our current campground. I’d much prefer to have camped here, but cell phones are marginal in some of the camping areas and given that we needed a lot of communication when we arrived, we opted for a safer location. Fort Stevens is a large state park, with great bicycling trails, long stretches of beach, big dunes, good campsites, historic sites, views, and even a shipwreck. The Peter Iredale ran aground here about a century ago, and the bones of the steel ship are still embedded in the dense sand just off the beach. 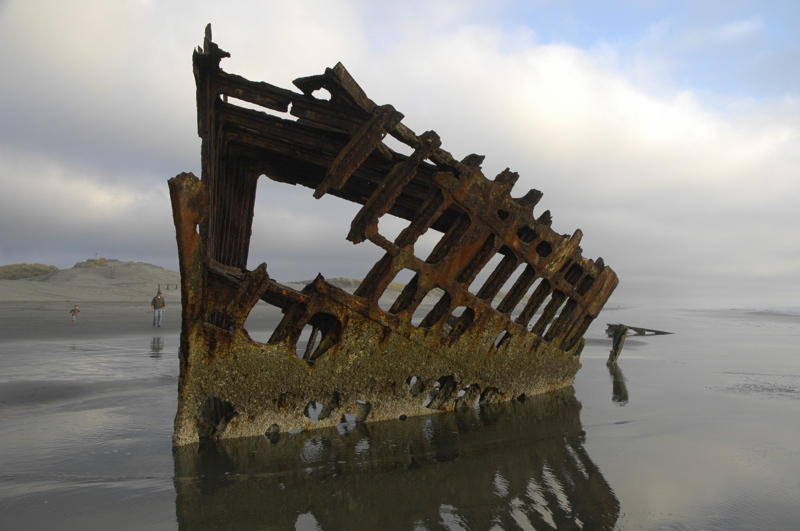 Stripped of just about everything and perpetually leaning hard to port, the Peter Iredale is a skeleton. People walk up, snap a picture, and walk away, but I like to look at it a while and imagine how the ship appeared in life, and imagine what it was like the day it crashed ashore. And speaking of skeletons, Halloween is looming. When we returned to the Airstream the costume was still in process, and it will be tough for Eleanor to get it done by Wednesday, particularly if we don’t have an electric hookup on Monday or Tuesday night to run the sewing machine. We also don’t know where we’ll be for Halloween, but we are aiming at southern Oregon to meet up with another 7-year-old girl who happens to full-time in an Airstream. More on that later. Just down Route 101 from Warrenton we found another little surprise, Sunset Beach State Recreation Area. 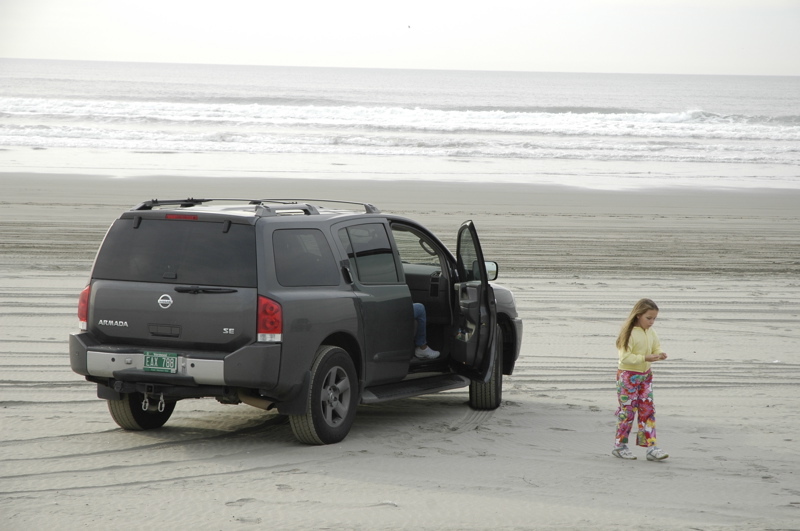 Just take a westerly turn and drive until you hit the sand (just past the trailhead for the Fort to Sea Trail) then head south along hard-packed gray sand toward Seaside. You can drive for miles along this beach. I expect in the summer it might get pretty busy, but on a chilly Saturday in October there were probably only two dozen vehicles on the sand in four or five miles. This would be a sweet spot to park the Airstream for a day at the beach. Overnight stays aren’t allowed, but you could easily put the trailer on the sand as a private cabana. We might even do that on Monday if we get out of the RV shop early enough. Things are turning around. The makers of our disc brake actuator, Active Technologies, came through promptly with some good news this morning. They have a few refurbished units which match ours, and put one in a box destined for delivery to us on Monday. 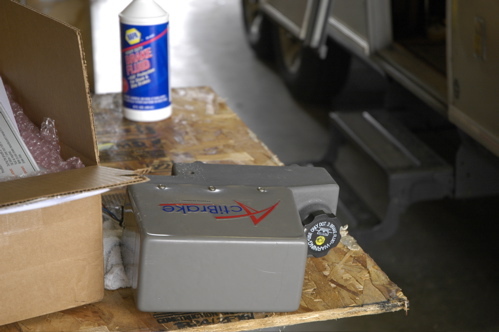 This is better than getting the newer unit because it will be a direct-fit replacement and thus won’t mystify the local RV repair shop quite as much. With this happy news, we embarked fifty miles south to Tillamook. Our friend Gunny has been parked in Salem in his Airstream 25FB, patiently waiting for us to show up and visit. I was worried we’d be forced to skip past Salem by the ripples from this delay, so we invited him to meet us at the Tillamook Dairy. 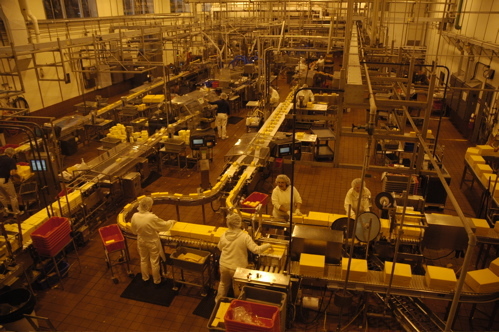 The dairy is the major attraction of Tillamook. Even now, in the off-season, the parking lot is busy with hundreds of vehicles coming and going all day. The Dairy is a cheese factory, with a casual restaurant and a couple of ice cream bars inside too. 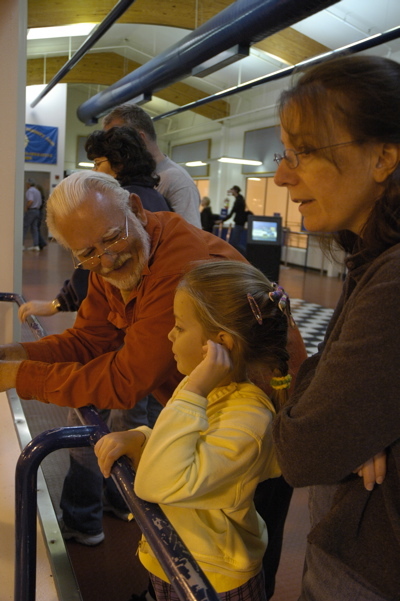 You can take a self-guided tour overlooking the production lines, which is fun for people from 7 to 60-something years of age, as we proved today. There are a couple of other tours along this stretch of Rt 101, according to Factory Tours USA. These include Pacific Oyster, just a couple of miles north of Tillamook, and The Real Oregon Gift Myrtlewood Company a bit further north. We dropped in on Pacific Oyster but there’s only an oyster shucking operation to see and the line was closed when we arrived. Route 101 is the real star of this trip. The road rolls and sways, dipping into cedar forest and then rising far above the ocean to reveal stunning views. It’s like this all the way from here to Humboldt County in northern California. Seaside Oregon is another little gem along this route. This town looks like just a strip mall from Route 101, but if you head west across the river at Avenue G, you’ll find the Lewis and Clark Salt Works location neatly enshrined among a neighborhood of cute little shingled cottages. Park here and walk to the water. Seaside has a large flat beach insulated from the neighborhood by a deep barrier of sea oats, and it’s really beautiful. In the early evening we found dozens of people crabbing in the low tide zone while the orange sun set cast reflections on the skim of water that still covered the sand. Now it is starting to feel like there won’t be time to visit all the things we want to see in this area. That’s perfect. I’d much rather feel I left a spot a little too early, than feeling like I stayed too long. If you believe that all things must be scheduled and everything must fit the schedule, you may not be well suited for a full-time travel life. Likewise if your fear of the unexpected paralyzes you into inaction. To live this traveling lifestyle, I have found that we need to deal with changes in circumstance that arrive like snowflakes in January. The brake actuator is a highly visible example but far from the only one. In the past two weeks we’ve probably had a dozen small unexpected changes to the itinerary due to weather, road closures, campground closures, mechanical problems, work considerations, and fuel prices. It’s all part of the game. Today the news is not good. The actuator we have is a discontinued model. The replacement model is not a direct fit. It requires a new bracket and different wiring, and thus it should be installed by someone who knows something about the wiring of an Airstream. But the nearest Airstream dealer is George M Sutton RV in Eugene, about 150 miles away, which is too far for us to go without brakes. None of the local service centers have ever seen this braking system before. The automotive shops don’t know 12v systems and the RV shops don’t know electric-hydraulic disc brake actuators. So we will have to find a way to telephonically transfer the knowledge of the original installers (Roger Williams Airstream in Weatherford TX) to the local RV shop. I’ve found a local company that is willing to attempt the task. The other bad news is that the earliest we can get the replacement part is Monday. We were not planning to spend more than about 10 minutes here but it seems we will have plenty of opportunity to get to know the local area. We have three days to wait, and I don’t like to wait, so instead we will pretend we meant to stop in Warrenton and explore some of the local attractions. Primarily this is the heart of Lewis and Clark country. 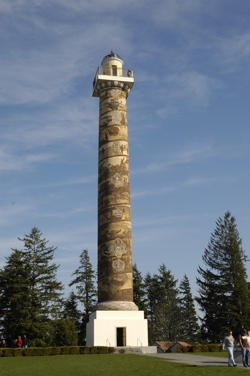 There are no less than twelve historic sites related to the famous expedition, including the Washington state park we just left (Cape Disappointment) and the Oregon state park just up the road from here (Fort Stevens). We can’t visit them all in a three-day weekend, and Emma would go insane if I tried, but we can at least visit one or two. There’s also a scenic drive down Rt 101 to Tillamook. We were going to do it with the Airstream, but with this delay it makes more sense to just go down for the day without the Airstream. Just between you and me, however, I will admit that I really want to hitch up and go right now. I’d like to be at a beautiful beachside state park, which was the major goal of driving down Rt 101 through Oregon. I’d like to be heading relentlessly toward the warmer temperatures of California (even with the wildfires burning down in San Diego County). And as with last summer when the wheel came off the trailer, it’s hard to remain calm in the face of a mechanical problem that has no clear resolution at the moment. We can only trust that things will work out. I think the Lewis and Clark historical sites will help with this. It will certainly put our current problem into perspective. Those guys in the Corps of Discovery basically floated, rode, and walked from what was (to them) the known world, into a completely foreign land of plants, animals, people, and incredible obstacles. They didn’t know when they’d be back, and they knew their chances of survival were unpredictable. The nearest analogue to that expedition today would be hopping in a space ship to Mars with a big pile of canned food. So at those times when I feel like I’ve received a sentence to serve under “trailer arrest,” perhaps it will help to make a visit to the nearby site where the Corps stopped for a month to make salt. My worst food problem is finding a grocery that stocks those tasty maple cookies I like. Looking at it that way, things aren’t so bad after all.